Accident investigators and safety advocates, however, have long complained that it's easy to change the paper logs or keep two different sets of records to evade restrictions on hours. This is why we now have a new federal mandate that will be taking effect December 18th, 2017 which will require all drivers to electronically record their hours behind the wheel, and electronic logging devices (ELDs) to be installed on all trucks built after 2000. Those opposed to the ELDs say the companies that hire them to haul freight will be able to access the electronic logs and pressure drivers who haven't reached their limit of legally-allowed hours to stay on the road even if they want to rest. The Federal Motor Carrier Safety Administration (FMCSA), whose mission is to reduce crashes, injuries and fatalities involving large trucks and buses, says that there are procedural and technical provisions designed to protect commercial truck and bus drivers from harassment resulting from information generated by the devices. As a company that provides electronic fleet tracking we admittedly may be slightly biased, but we see numerous benefits of electronic logs and feel this new rule is one that will pay off for the industry and general public for years to come. On April 5, 2010, the FMCSA published a final rule that required motor carriers with significant HOS violations to install ELDs in their trucks. The final rule took effect on June 4, 2010. But then in June, OOIDA filed a lawsuit with U.S. Court of Appeals for the Seventh Circuit challenging the final rule and the Court cancelled the final rule. Part of the reason for the court cancelling the rule was that the court noted that the FMCSA had not estimated the safety benefits of ELDs currently in use and how much ELDs increased compliance. So if you can’t prove that the benefits of ELDs are real, then you can’t mandate them. Trucks with ELDs had an 11.7% lower crash rate than non-ELD equipped trucks, and they also had a 5.1% lower preventable crash rate than trucks without ELDs. With these figures the FMCSA estimated that by simply having electronic logging devices installed in trucks 26 lives can be saved every year and they can prevent over 560 injuries as well. That’s each and every year. Save $487 in drivers filling out Record of Duty Status. Save $56 in drivers submitting Record of Duty Status. Save $120 in clerks filing Record of Duty Status. Save $42 via the elimination of paper books. That works out to be a total of $705 per year in just paperwork savings alone – and that’s a conservative estimate. All told, the safety administration estimates the electronic devices will provide a net savings of $1 billion a year, mostly through paperwork reductions. With fewer accidents on the road, insurance claims also go down, and costs are further reduced. While the ELD is going to be a requirement when it comes to your drivers logging their HOS, if companies institute a complete GPS fleet management system from Synovia you can up your safety and savings even more. With a complete GPS fleet management system, you can see in real time if your drivers are driving the most efficient routes. You can also tell if there are cases of hard accelerating, or excessive idling, which can lead to increased fuel costs. Maintenance can be monitored so that vehicles get the right amount of scheduled and preventative maintenance, keeping them on the road making money. Trucks that are in good working order also don’t break down on the side of the road, creating issues on the highway that can lead to accidents, or put your driver’s safety at risk. Together, the right ELD tracking system and complete GPS fleet management system can keep drivers and trucks safely on the road as well as boost dollars going to the bottom line. If one of these arguments isn’t enough to justify ELDs the other sure should be. If there’s one thing businesses like to do, it’s maximize profits. This can be done in several different ways. One of them is to maximize your uptime and minimize your downtime. If your employees are busy working, they’re busy making the company money. Another way to increase profits is to limit what your company spends. The less money that goes out the door, the more that goes to the bottom line. With asset tracking from Synovia Solutions, you can do both. First, let’s focus on keeping your employees working. When you have an asset such as a lawnmower, a backhoe, or a portable storage unit filled with equipment your employees need to do their jobs, you want that asset to be available when you need it. Because if it’s not, your employees can’t work, and they can’t make you money. With asset tracking from Synovia you can know exactly where all your pieces of equipment are at any hour of the day. If an asset goes missing you no longer have to spend valuable employee time tracking it down, and you don’t have to have an employee sitting idle because they don’t have the equipment they need to do their job. With asset trackers you are also able to keep a tighter record on the number of hours a particular piece of equipment may have been used, which means you can keep tighter control over maintenance. Just how long has it been since the Bobcat you use for landscaping work had its oil changed? Knowing information like this allows you to do preventative maintenance instead of costly repair work. All of this leads to increased productivity, and increased profitability. So asset trackers can help keep employees working, and that helps keep money coming in. But the most impressive thing about asset trackers is how they can help boost the bottom line by helping to keep the money from going out. To begin with, there is the obvious: asset trackers help prevent theft. If a company is known for putting trackers on its equipment, it’s less likely that thieves will be tempted to try to steal it. It’s also less likely that employees will “borrow” equipment from the company without approval – equipment that may just end up in the back of that employee’s garage for years to come. It is estimated that the cost of equipment theft to companies can range between $400 million dollars and upwards of a billion dollars per year, and the National Insurance Crime Bureau estimates that only about 23% of all equipment that gets stolen ever gets returned. 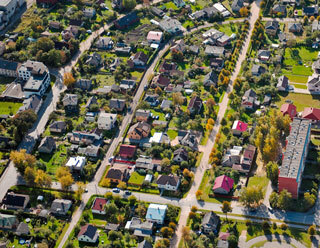 With an asset tracker, if you unfortunately are the victim of theft, you won’t just know it was stolen, you’ll know exactly where your stolen piece of equipment is – and the authorities are far more likely to be able to assist in recovering your assets when you can tell them exactly where to look. Finally, many insurance companies are willing to drop your insurance rates if you have asset trackers attached to your equipment, so there’s a cost savings associated there as well. So why use Synovia’s asset trackers? 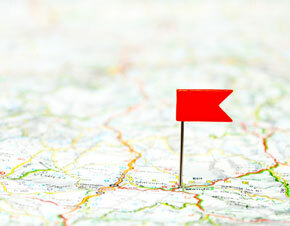 Since asset trackers can save you money, what makes one asset tracker different from the rest? In our case it’s the company that supplies them and supports them. Why does Synovia say you’ll have a better experience with our trackers? The answer’s two-fold. First of all, there’s ease of use. In the time it took you to read that last sentence you could have probably installed one of our trackers. And once they’re installed, you can begin tracking your assets right away. There’s no need to get back in touch with the company that sent them to you and ask that they, “turn them on.” They arrive at your door ready to go. Secondly, as a customer you will also have access to our online support center, which we call the Customer Portal. Synovia’s Customer Portal lets you search for solutions, create a case, or check on the status of an existing case. You will also have access to live customer support 24/7. Something else that we feel needs to be said about our company, is the history of the clients we’ve worked with. Because we’ve worked with so many different companies, we have the experience and knowledge to understand what customers want and expect from an asset tracking company. School systems trust us to keep track of their school buses. Construction companies depend on us to keep track of their equipment. Municipalities rely on us to keep track of their public utility vehicles. So if you think that saving money with GPS asset tracking is something that your company might benefit from, why not ask for a demonstration from a company that shows what true customer service is? Reach out to us here at Synovia Solutions. It’s nearly wintertime in the United States, and across much of the country that means a seasonal shift in approach for construction companies. Cold weather sets in as the seasons change, and plummeting temperatures change the game for everyone who works outdoors. As you might expect – and U.S. Census Bureau data backs up this statement – business tends to drop for construction companies. However, with changes in the economy and construction technology in the past couple decades, there is no off-season. Your business is expected to remain active even after the first snow. Here’s how you can accomplish that, maintain quality standards – and keep your crews safe. You’re always careful about making sure every part of every job is done right, but in cold winter weather the margins are slimmer. Any minor mistake can snowball into a major problem, and the normal ways of doing things may not cut it when the temperature dips below freezing. Because of that, it’s critical to get all the details right when you’re building in winter. Cold weather causes many typical construction materials to act differently than they do when it’s warm out. Water in concrete will freeze, resulting in crystals forming in the mix and the dried concrete failing to reach its full strength. Masonry has the same issues, as water expands while freezing which can cause strength issues in a finished masonry project. Digging foundations is made more difficult by frost in the ground – once the frost level goes below 8-12 inches, special machinery may be needed to penetrate it. When snow or freezing rain covers building frames, it becomes impossible to apply sealants. These are just a few of the problems that winter construction can bring, and any one of them can deal a heavy blow to your efforts. Winter is especially taxing for vehicles and equipment, making maintenance more an issue than ever. First of all, you must prepare your own equipment for cold weather. Preventative maintenance and checks of heat and defrosting systems are a good start. It’s also important to continually monitor your equipment all season long – don’t just give each vehicle a once-over and assume it’s good to go. This is one place where Synovia can help. Our Silverlining™ suite includes real-time engine diagnostics that give fleet managers the ability to know when repairs are needed before a breakdown. Unexpected repairs are a thing of the past, and the maintenance that’s done is far cheaper. Fuel economy also becomes a bigger issue than normal during winter. Cold weather affects efficiency in a number of ways – cold engine oil increases friction, icy roads decrease grip and waste energy, even heaters waste energy. Synovia engine diagnostics allow fleet managers to monitor efficiency and take necessary steps to save fuel. Location tracking also helps, by giving insight into whether drivers are operating vehicles efficiently and whether they’re driving optimal routes. Additional equipment is required past your usual arsenal as well. Heavy-duty equipment may be needed to properly dig through the frost layer to lay a foundation. If inclement weather strikes at the wrong time, the frame needs to be covered for sealant application. Masonry and concrete must be kept warm throughout the whole process, and anything from heating the components to simply heating the whole work site could be called for. If wind chill is a factor, wind breaks may need to be built as well. Job site safety is top of mind for every project, but again, the unique conditions of winter mean extra effort must be exerted to make your team safe. Ice, snow, and cold all make the job site a bit more dangerous than it would be in the pleasant weather of spring or fall, or even the heat of summer. Driving in winter is an issue, whether it’s a truck going from site to site or a piece of equipment moving around on an individual site. Ensuring drivers are properly trained and licensed to operate the vehicles they drive in winter weather is critical. Simply reminding workers of the dangers of icy roads and frozen job sites is important as well. Workers being struck by vehicles on site is a major concern, since it’s far easier to skid or lose control of a vehicle in the ice or snow. Because of this, traffic controls are just as important on a work site as they are on the road. Signs, cones, barrels, and barriers can all be used to protect drivers and pedestrian workers alike. It’s also advisable to have workers wear reflective vests when on a site with active vehicles and other equipment. Every little bit you can do to keep workers visible and protected from the equipment they work around will help. Getting stranded in a vehicle is not only more likely in icy and snowy conditions, but the cold makes it more dangerous than it would be in more pleasant weather. It’s important to train your drivers to know what to do in such situations. It’s instinct to want to seek out help, but that’s one of the worst things you can do. Drivers need to know how to stay warm, signal for help, and prevent maladies like frostbite and carbon monoxide poisoning. This way a stranded vehicle will be a temporary inconvenience, rather than something much more frightening. It’s also a good idea to track vehicles as closely as possible, so you know where vehicles are and can direct help to the right location without delay. A Synovia GPS tracking system gives fleet managers constant visibility into vehicle locations in real time, 24/7. Not only does this allow a manager to locate vehicles, but alerts and reports monitoring driver behavior can also help crack down on unsafe driving. This data is useful for route-building and other reporting year-round, but in winter when safety is at a premium it’s absolutely critical. Slick surfaces are dangerous for workers on foot as well as ones operating vehicles. Whether on the ground or on the framework of a building or on a scaffold, slips and falls are an issue in the cold. Again, training for your workers is important. Walking more carefully and wearing the proper footwear will protect against a lot of issues. Make it clear to your team that rushing will do more harm than good, and that safety is a priority over speed. It’s also important to clear snow and ice from walkways as much as possible. No matter what, careful planning is important before any winter construction job starts. You can’t get caught off-guard by a blizzard, with no contingencies in place. Your needs will differ based on the unique project you’re working on, but the principle – preparation – is universal. Your business can’t afford to take the winter off. You also can’t afford to sacrifice safety or quality. With this advice and a telematics partner like Synovia, your construction company will thrive in the cold. It’s October, which means fall is here. In much of the country there’s a chill in the air, the leaves are starting to turn, and football season is getting into gear. But for fleet managers, the beginning of fall means more than anything else that it’s time to start preparing for what’s next – winter. There’s a lot to do. Vehicles used year-round have to be prepared for the change in weather. Equipment that’s only used in winter need to be retrieved from storage and prepared for a return to action. You can’t wait until roads are already covered in ice and snow to change over. The process has to start now. 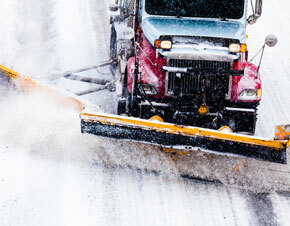 Winter means dangerous road conditions, which means that your fleet – no matter whether you’re managing for public works, sanitation, landscaping, or any other purpose – needs to be prepared for a struggle. Ice and snow mean more wear and tear on equipment inside and out, and without the proper care, that can lead to breakdowns. A vehicle out of commission takes an even greater importance when it means a neighborhood doesn’t get plowed, or a driver is stranded in freezing conditions. When the weather turns, that means vehicles that haven’t been used in months are making a return to service. Snow plows, salt trucks, and other equipment all come out of storage, and it all needs to function perfectly. Proper pre-storage maintenance is critical, as is the proper storage procedure, but in October, it’s too late for that if you didn’t do it right last spring. So the work has to be done now. The most obvious things are ensuring good traction and reliable use. Check the tread depth and wear on tires that have seen some use. Cold weather deflates a tire, so check tire pressure and make sure they’re properly inflated. Make sure the four-wheel drive is functioning, if applicable. And if necessary, change to snow tires or put on chains. Do a full engine check, and replace fluids like oil and antifreeze if needed. Check the charge on all batteries, and make sure fuel tanks remain at least half-full as it helps prevent residue from freezing in fuel lines. The exterior is also critical to maintain. Check the windshield for any minor chips or cracks, as temperature changes can turn them into major problems. Visibility is an issue in bad weather, and slushy and salty conditions wreak havoc on a windshield – so check and replace windshield wipers if necessary, and always keep washer fluid well-stocked. Also, make sure front and rear defrosters are functioning, as well as mirror defrosters if you have them. A coat of wax will help prevent damage to the vehicle’s body from snow and salt, as will regular cleanings – especially of the undercarriage, where much of the contact between the elements and equipment happens. This can’t be a one-time thing, either. It’s critical to keep track of how your fleet is handling harsh winter conditions on a regular basis, with frequent and detailed maintenance. Fault code monitoring and engine diagnostic tools give you a constant view into what is and isn’t working, and will help prevent your drivers from ending up stranded in the ice and snow. Even the best planning can go awry, though. Smart maintenance and the information you get from engine diagnostics will minimize problems, but a battery can fail at any time, and even a good driver can hit a patch of dark ice and end up on an accidental off-road adventure. And that’s not to mention what the other drivers on the road can do. In winter, anything can happen, and that can leave a driver or a team stranded and in need of help. Preparation is key. Have a plan in place in case a vehicle is wrecked or otherwise stranded. Your fleet should have towing capacity, or if that’s not feasible, build a relationship with a towing company that you know is reliable, able to handle the types of equipment you use, and able to handle the elements. Additionally, it’s important to have a way to locate your vehicles. Detailed route information is one way – knowing where your individual vehicles might be is a great start to finding them. An even better way, though, is precise and granular GPS tracking of each and every piece of equipment in your fleet. With GPS, as soon as you get a call about an incident, it’s easy to know exactly where your people are, and what’s the fastest way to get there. It’s cold, it’s icy, it’s dangerous. Don’t leave your drivers stranded through lack of planning. No matter what your vehicles are doing once they get to the site, fleets of all kinds benefit from having better routes to follow. That’s true in all weather, but particularly when ice and snow enter the equation. With the elements already making every mile a little more taxing on engines and transmissions and more. Because of that, efficiency is key. The less your vehicles are on the road, the less likely it is that they’ll be damaged. Additionally, for plowing speed matters. The longer it takes, the more time citizens and community residents have to drive on dangerous roads, and the greater the chances that an accident can happen. It’s also important to conserve resources as much as possible. Fuel and time are always at a premium, and that’s amplified when the weather gets rough. But when you’re salting roads as well, you also have to make sure that you’re not wasting an expensive – and very limited – resource. Ensure that vehicles are taking the most efficient routes, and that you don’t have roads getting salted more than once unnecessarily due to route mixups. GPS tracking tools give you the ability to make sure the routes you plan are the most efficient ones possible, and that your drivers are actually following them. 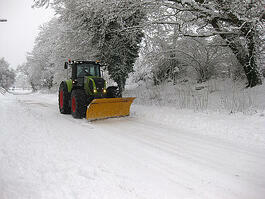 It’s especially important to assess planned routes if there have been major changes to local roads since last winter. Perhaps a new neighborhood means increased traffic in a previously-empty area, or road expansion and construction means getting from one place to another takes a totally different approach. Planning now means not only that the first snow can be dealt with, but also that if more and larger roads require more vehicles and more supplies, they can be acquired now rather than rushed into service at the last minute. Where possible, all routes should also be inspected ahead of time, and whatever steps are available to prepare the route for plowing and salting should be made. This will likely be easier for corporate campuses and neighborhoods and other private areas where government money doesn’t need to be obtained, as it can be done more quickly. Fix potholes. Level raised manhole covers. Make note of any obstructions like speed bumps that need to be avoided. Find and mark all utilities and emergency equipment and anything else that has to be reachable. Look at where plowed snow is going to end up, and plan routes that prevent blockages in crucial places. All of this applies to any fleet that operates in winter weather, no matter what the circumstance. Many are municipal fleets, but private fleets also have winter work to do. If you’re a landscaping company, for example, you may need to be able to get out to neighborhoods and businesses to help clear trees felled by ice, or to do plowing on streets that aren’t under governmental purview. No matter who’s paying the bills, things like route efficiency, safety, and maintenance are critical when the weather turns. Take steps now to prepare, and don’t get left out in the cold. Jon King doesn’t stop. You wouldn’t know it to talk to him – the CEO of Synovia Solutions is a calm and considered man, speaking only after taking a beat to think and choose just the right thing to say. But in his work, King is constantly moving, and that’s just the way he likes it. That active style is something that he’s brought to Synovia since his arrival in 2011. He’s the kind of executive who’s not only participating in the actual business of his company, but who you’re excited to see involved in new projects. That’s not just because of his years of experience. It’s because the things Jon King gets involved in tend to be successful. King’s somewhat of an expert in management, both of a business as a whole and of people who work there. Part of that comes from a career that’s spanned a number of industries, businesses from start-ups to Fortune 500 companies, and a tour of military service. He’s experienced all kinds of different styles, and he’s worked in management at all levels since early in his career with Xerox. “The first management job I had, I was no more ready to lead ten people than I was to land a man on the moon,” King said. “I learned lessons that have stayed with me throughout my whole career, and I’m thankful every day for the time I spent there.” It’s easy to see why. Today in addition to his work at Synovia, King is a guest lecturer at Butler University, IUPUI, and the Kelley School of Business at Indiana University. That training isn’t something that gets handed off to an outside firm, or an online walkthrough. Synovia senior management – including Jon King himself – meet with top clients face-to-face twice yearly to review in-house training, software usage, and any other training and functionality issues a client may have. Clients know that Synovia buys into their success because the executive team buys into them. That emphasis on openness means that Synovia has an ability to change and a flexibility that you just don’t often see in a corporate setting. King has the experience to know what works, know what doesn’t work, and build on that. In just a few years under King’s guidance, the pricing model Synovia Solutions – and now the industry as a whole – offers to school districts has been totally revolutionized. King has also helped to build partnerships with companies to get software to market faster, and he shepherded the debut of the game-changing Here Comes the BusTM website and app for parents, students, and schools. All major changes, and all have fueled the growth that Synovia has seen in recent years. The major source of that growth has been in school bus fleet management, in large part because of those innovative changes. The now-abandoned previous pricing model put a significant burden on the client, with large up-front charges that increased with the size of the fleet. Schools simply couldn’t afford it. Business wasn’t growing. So a change, spearheaded by King, was made. “You’re buying a service from us,” King said. “At the end of the day you’re buying information from us. We’re not a hardware provider, we’re an information provider.” So having clients pay for hardware didn’t really make sense. Synovia’s growth in the K-12 market has been powered not only by those changes, but also by purely new innovation. The Here Comes the Bus app is part of the crest of that wave. “It’s another differentiator for us in that space,” King said. Here Comes the Bus is a totally different thing from what other competitors are offering to schools, and that makes it a massive difference-maker for Synovia. But it’s not just the app itself that is making a difference – it’s the app’s audience. Until Here Comes the Bus, all of Synovia’s services have been aimed at businesses, not at individual consumers. But since Here Comes the Bus is an app for parents, rather than for school administrators, it’s a new audience for Synovia’s products. “It’s educational, we’re learning, but at end of the day we think it’s going to be a game changer on several fronts,” King said. It’s just another reason for schools to want to work with Synovia, and for the schools that work with us to continue to do so for years and years. “In the world we live in today, where security and safety are even more important to parents, it’s big,” King says, as it acts as part of a holistic set of tools for schools and parents to make sure kids get to and from school safely every day. That new experience for Synovia is part of what Jon thinks will help the company as it expands its role in other fleet management verticals. “The biggest opportunity [for Synovia] is in the private sector, in the specific verticals that don’t require changes to our technology,” King said. King envisions identifying the private fleets that can use GPS technology and software to the greatest level of effectiveness and developing game-changing products and services for them to mirror the success of Synovia’s K-12 vertical. Sectors like construction fleet management are the next big targets for Synovia Solutions, and specifically King thinks that concrete and cement transportation are specific disciplines where Synovia can do a lot of good. It’s critical for vehicles to be able to make it from the mixing site to the construction site before the material sets, and GPS tracking allows fleet managers to plot the most efficient routes to guarantee that material isn’t lost needlessly. “That’s a big opportunity and we’d like to think we can provide a solution,” King said. New growth has to be managed intelligently, though. When pushing Synovia forward, scalability was top of mind for King. That’s part of what prompted his search for partnerships in the K-12 sphere. “We were never going to have a sales organization big enough to get to the market quick enough,” King said. Balancing growth against smart investments in infrastructure, and building partnerships to cover gaps rather than spending big to fill them, all fit together as part of an intentional strategy. “To [manage growth carefully] with a small business is extremely critical because you don’t have an unlimited checkbook,” said King. When a company enters into a partnership with Synovia, whether as a client or as a service provider, you’re working with a company that reflects its chief. Expect action, expect innovation, and expect success. Expect that, like Jon King, Synovia Solutions will not stop. As a fleet manager, keeping your vehicles and drivers safe is a primary concern, especially with accident management costs rising 5% from 2013 to ’14. The fact is, companies are now paying more to get their vehicles back on the road. There are a variety of reasons for this, such as technology installed in vehicles and the use of alternative manufacturing materials like aluminum, carbon fibers and plastics. Because of this, more parts need to be replaced rather than repaired and those repairs require more sophisticated equipment. Even safety features have caused a spike in repair costs in recent years; air bags, sensors, and seat belt retractors can add thousands of dollars to an accident repair job. As the price of repairs continues to rise, fleet managers are taking notice and looking for ways to avoid costly accidents. GPS Tracking technology from Synovia Solutions can help you protect your fleet and minimize repair costs. With our GPS, fleet managers can track vehicles, map routes, and create more meaningful traffic reports. By using this information, fleet managers can more accurately account for their vehicles and reduce risks to their fleet. Fleet managers can also review the driving habits of their employees, so you’ll know who is driving safely or not. By having the safest drivers on the road at all times, you’ll limit the chance of an accident, lower repair and insurance costs. Keeping your fleet in top-driving shape can also increase safety and decrease repairs. Our Engine Diagnostics feature allows you to be proactive about fleet maintenance, instead of reactive. You’ll know in real-time when a vehicle needs some work, or is due for maintenance. This helps you better manage your fleet, and keep you from getting caught off guard by repairs. But that’s not all you can do. Through Engine Diagnostics, you’ll know how many miles per gallon your fleet gets, and how to improve fuel efficiency. You can even set regular reports so you can review components like engine hours and fuel usage. Should a truck break down, GPS tracking makes it easier to find, reach, and replacing. Helping you keep your delivery schedule—and satisfied customers. Start reducing fleet management costs today. Getting started with Synovia Solutions is simple. We offer a free, no obligation trial so you can experience the benefits first hand. We’ll send you a device to plug into your vehicle so you can starting learning how to view vehicle locations, engine idle time, speed, driver behavior, diagnostics, and more in real time. After you decide Synovia Solutions is right for you, we’ll provide installation on your entire fleet with no upfront costs. To learn more about Synovia Solutions, visit www.synoviasolutions.com or call 1-877-796-6842. 5% Guarantee: You save 5%. Or we pay 25%. Managing a fleet of 75 or more vehicles can be a cumbersome and costly task. Synovia Solut ions can make your job more time and cost efficient, and we have the guarantee to prove it. To get started, customers are asked to record up to a 60-day baseline for fuel consumption and payroll inefficiencies. In addition, our seasoned sales professionals have lots of savings tips and ideas. If monthly audits from Synovia Solutions don’t show a 5% savings on fuel consumption or payroll over the first 12 months of use, you get 25% off your invoice for the balance of the term. To experience how Synovia Solution can make a difference in your business, we offer a free, no obligation trial. If you decide we’re exactly what your fleet needs, we’ll get you started with no upfront costs. To learn more about Synovia Solutions, visit www.synoviasolutions.com or call 1-877-796-6842. 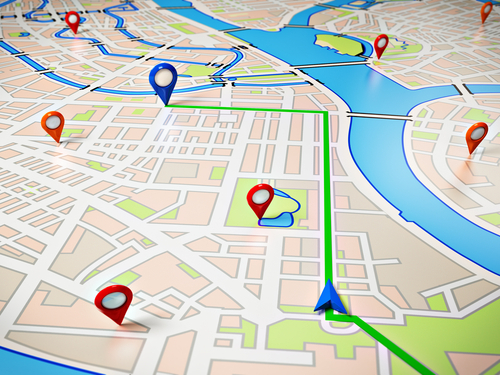 For most fleet managers, implementing a GPS tracking system isn’t a matter of choice. Rather, it all comes down to budget. And since many GPS-technology providers require a sizable upfront investment just to get started, it’s no wonder so many fleet management professionals are forced to forego the benefits of a proven fleet management system. At Synovia Solutions, we decided to solve the cost and service-related issues that keep so many fleets from adopting GPS tracking technology by introducing Synsurance™. Available exclusively from Synovia Solutions, Synsurance is an all-inclusive, turnkey service plan that represents the ultimate in customer protection. With Synsurance, there are no upfront costs, so you can start experiencing the safety, savings and service benefits associated with Synovia Solutions GPS tracking technology right away. The program also includes performance guarantees (we pay if we don’t perform) that will also ensure success. With Synsurance, there is no need to delay the implementation of fleet telematics due to budgeting or appropriations hurdles because it costs absolutely nothing to get started. Synsurance provides all that is necessary to begin using Synovia Solutions GPS tracking technology, including hardware, software, installation, implementation, maps, hosting, replacement spares and more. Choose Synsurance and your service plan is guaranteed not to increase in price for the entire length of your service agreement. In addition, you will never pay any hidden or extra costs – guaranteed. Every Synsurance service plan comes with a hardware warranty that lasts the duration of your service agreement. If Synovia Solutions-supplied vehicle hardware fails to perform, you’ll receive a replacement at no cost to you. With Synovia Solutions, you can track your fleet using an intuitive dashboard, complete with unlimited access to live customer support, online training, educational videos and on-site assistance as needed. Any support call you make related to Synovia Solutions software is considered a first occurrence until it is resolved. If the same issue requires another support call within the next 30 days, you will be credited one day’s charge for your entire fleet. If a piece of hardware fails, you’ll have the ability to replace it with a spare unit immediately. Afterward, just send us the defective unit and receive an additional spare within 48 hours. Because all Synovia Solutions GPS tracking tools are built on Silverlining™, our user-friendly web-based SaaS platform, we host the entire solution for you. What’s more, all software updates and upgrades are included. With a highly scalable and affordable service plan, many Synovia Solutions’ customers have found Synsurance to be self-funding within 90 days! Contact Synovia Solutions today to learn more. Every time you get in a motor vehicle, you’re taking a risk. 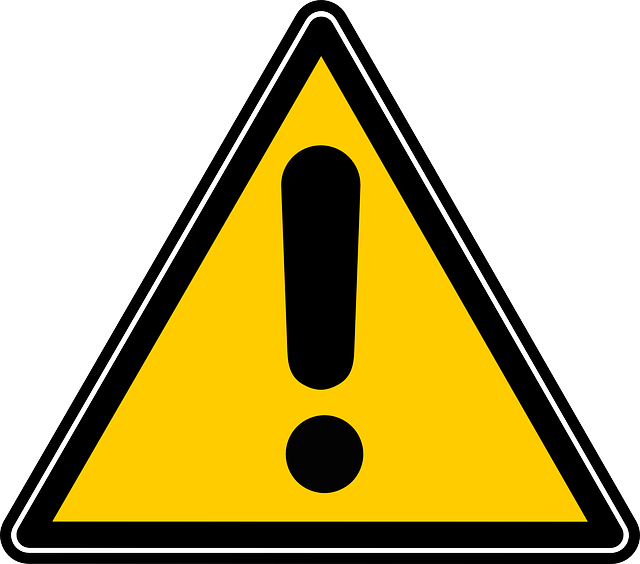 Even for the most skilled of drivers, operating a car, truck, or other automobile is inherently dangerous. Being safe isn’t about eliminating the risk of injury to yourself and others, because that’s simply not possible. It’s about limiting that risk, managing it to drive as safely as possible. That applies just as much to those who drive professionally as to those who do it recreationally or simply for transportation. That’s why risk management throughout your business’ fleet of vehicles is one of the most important responsibilities a transportation or fleet manager has – because lives depend on it. Here are some steps you can take to make sure your drivers and vehicles are as safe as possible. Most of the people who are operating your vehicles and equipment are likely to be very capable and skilled drivers. Training can help keep those skills sharp, and help refresh knowledge of rules of the road and job site. But there’s more to it than just that. No driver operates in a vacuum. A good training program will allow you to assess, critique, and improve how your drivers interact with other drivers on the road, and how they interact with their colleagues and surroundings on a job site. Being able to ace a closed-course test, after all, doesn’t mean a lot if aggression or recklessness take over in the real world. And training doesn’t mean a lot if it doesn’t translate to actual driving. Aggressive and unsafe driving practices don’t just put your drivers and others at risk of injury, it can also cost you money. Speeding is a fairly common offense, but it can do a lot of damage. It’s dangerous in and of itself. It can lead to other dangerous behaviors, like swerving through traffic and cutting off other drivers, and if an accident happens, it increases the severity by magnitudes. It also reduces fuel mileage and causes undue wear and tear on vehicles, which can mean breakdowns that shouldn’t be happening. Monitoring fleet driving practices reduces the risk of collisions and injury, and reduces the risk of damage to vehicles and property. Knowing what your team is doing on the road and in the field is critical. The more drivers drive, the greater the risk. That’s just common sense, and beyond simply saving miles and money, it’s why limiting the amount of driving your drivers are doing is a smart move. That doesn’t mean turning down jobs or cutting service. It means helping your crew to drive more efficiently. Information is key here. If you know the routes your drivers are using – meaning they’re planned, and there’s accountability for drivers who leave the route without a good reason – you can constantly analyze them, look for alternatives, and seek out the most efficient route. You can also look at vehicle use during off-hours, and set limits on what employees can and can’t do when they’re not on the clock to prevent further risk to them, your vehicles, and your business. Breakdowns are inconvenient. They take vehicles off the road, and make it harder for your business to function and your jobs to get done. But when you look at your fleet through the lens of risk management, a breakdown can be a disaster. Poorly maintained vehicles can become unsafe to drive and use, and if a driver or manager doesn’t know maintenance is needed, a small problem can snowball into something big. A belt can snap, or an axle can break, or an engine can blow out. If that happens on the road, it could end in injuries – or worse. Proactive maintenance helps prevent that from happening. Regular diagnostics on the engine, brakes, and other vital systems help catch trouble miles before it arrives. Monitoring vehicle emissions can also help locate engine trouble that might not be caught otherwise, and regular tune-ups and oil changes keep vehicles running longer and safer. As manager of a fleet, part of your duty is to manage risk and make your drivers as safe as possible. It protects them, it protects your investment in your vehicles, and it keeps you from ending up in insurance or lawsuit limbo. You need tools to be successful, though – and Synovia Solutions™ fleet management technology can do the job. It provides detailed location and diagnostic data that allows you to monitor routes, prevent breakdowns, and minimize risk as much as possible.